During Sunday’s early morning training session, a group of 20 LifeCycle Challenge cyclists accompanied by the back up team staff, presented their 2018 kit to Foster Clark’s Head of HR Steve Vella. Foster Clark is the title sponsor of Foster Clark LifeCycle Challenge 2018 for the second consecutive year. LifeCycle (Malta) Foundation is celebrating its 20th anniversary since it was founded by Mr Curry. 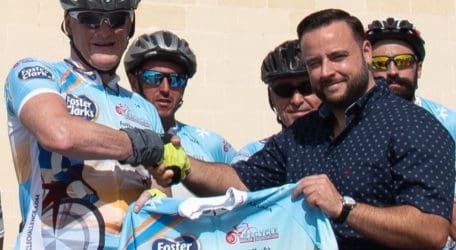 Every year, LifeCycle holds a gruelling cycling challenge, each time in different countries to generate the necessary funding for LifeCycle Foundation’s mission, that is to raise money for life saving equipment to help persons suffering from kidney failure and to raise awareness about organ transplants in Malta. Foster Clark is a story of a dream, which started in 1967, by Paul Busuttil who had the will to seek out a new business venture, which has become a global brand of choice. Foster Clark’s products are now availiable in more than 80 countries, and enjoyed by an ever-increasing number of consumers across the world. One can donate online or by sending an SMS to 5061 7370 to give €2.33, 5061 8920 to give €6.99 or 5061 9229 to donate €11.65. You may also donate by calling 5160 2020 to give €10, 5170 2005 to give €15 or 5180 2006 to donate €25. Bank details are Swift code VALLMTMT, IBAN number MT 18 VALL 22013000000014814521017, Bank name: Bank of Valletta, Account number 14814521017.